Your Sedona tour begins in the morning with pickup from hotels in the metro Phoenix area by Chrysler Town and Country van for a comfortable experience. Enjoy just the right balance of narration and quiet time to take in the scenery and history as you travel to Sedona. On the way, admire the beautiful Sonoran Desert scenery north of Phoenix. A few possible spots to stop during the ride include the historical Montezuma Castle National Monument or Oak Creek Canyon. Your guide will take you to Sedona for a 5- to 6-hour visit, making sure you see all of the best that the area has to offer. 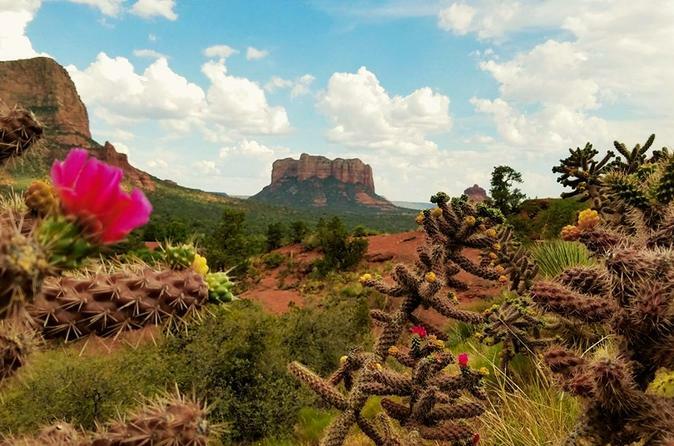 Sedona is one of Arizona's top destinations for its must-see sights such as Bell Rock and Chapel of the Holy Cross. Admissions to any added stops are an extra expense. Bottled water and soft drinks are included; any meals are at your own expense. Dining options can be discussed after confirmation.